India constantly faces the dilemma of whether to impose import duties on solar equipment or not. An imposition of 70% of safeguard duty could further raise prices by 35%-40% on one hand, but a non-imposition could hamper the domestic manufacturing industry. The Indian solar developers import majorly from countries like China and other neighboring countries because products are available at reasonable rates. This is impacting the domestic manufacturing industry which led to a group of major solar manufacturers pleading for the imposition of a safeguard duty to protect domestic manufacturing. However, this duty imposition could further escalate the prices to above INR 3 per unit from the currently prevailing INR 2.5 per unit. Read more about India’s Proposed Safeguard Duty . Moreover, with the Chinese local demand facing a slowdown, China would look for huge exports to countries like India and could even lower prices to maintain an equilibrium. India thus needs to act fast if it wants to impose safeguard duties because if the Chinese domestic demand for solar products slows down it would flood the Indian market, which would further drive down prices in India. If this happens, developers would not want a duty imposition at that point of time as it would be a point of no return. 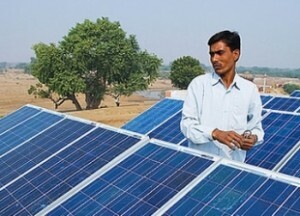 Solar developers in India are crying foul that a duty imposition could also adversely hit the Indian 2022 RE target. All these factors have led the ministries to be in the crosshairs. While they had proposed a non-imposition of safeguard duty earlier this year, the solar manufacturers are still seeking for some relief citing the protection of PM’s Make in India initiative and safeguarding thousands of jobs associated with construction of capacity. On the other side, around 8 GW-9 GW of solar energy capacity is under construction at various stages and about double of this capacity is tendered out for allocation. If at this stage a duty is imposed it might hamper solar development as prices would increase and further there is no clear road map of how these additional costs (duty on tariff) would be passed on. Industry experts are afraid that these projects could fail to take-off amidst this duty chaos in India. No Discoms would come forward and sign future PPAs in such a scenario. While I think the imposition of 70% of duty on tariff would be too high for the industry to digest, the ministry could look at a smaller percentage to start with. Solar tariffs are the lowest in India and the industry can easily bear a small pinch.